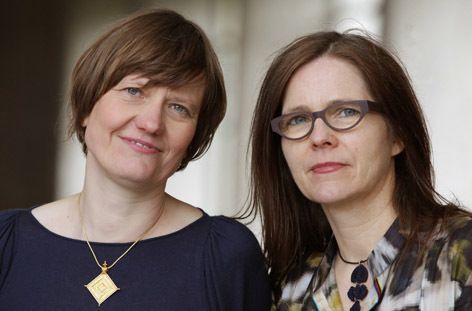 Since 1998 we – Petra Sahm and Babette Permantier – are working together as a design team. We design collections, products and fabrics for the interior textile industry. With the increasing globalisation of the textile market we concentrate on customers from the Asian production countries, mainly India. Our design work includes traditional and innovative techniques such as weaving, embroidery and print. These are translated to trend-orientated, contemporary collections, focusing the European and American retail markets. We create designs for cushions, plaids, bed and table linen, tufted bath mats, rugs, knotted carpets, curtain and upholstery fabrics. Our personal support for the development of collections always reflects actual design trends, specifications of the target market and production requirements. One of our strengths in design development is dobby woven fabrics. On a computerised 24-shafts handloom we are able to work out real woven samples that are fully adapted to the production capacities of our customers. Weave simulation and technical specifications are made with the French simulation program Point Carré. Our wide experience of designing related to production, retail and marketing also enriches our forecasts and trend consultancy for the home decor market. We have been invited to do trend seminars and trend presentations in Germany and in India. Our creative inspiration has further evolved into exhibitions, presentation and graphic design. Strongly influenced by natural materials and traditional handloom textiles we launched a private brand in 2001, called LOTUS COLLECTION.